Can you believe I have even more yarn goodies to show you. In my defence I had forgotten about buying these when I went to Ravelry Day. Technically I hadn't bought them when I left the house. I had set up my Snipe account to bid for the yarn when the sale was about to end. I love sniping for ebay bargains. I use Myibay and it lets me set the highest price I will pay for an item and it then automatically bids for it just before the auction closes at the lowest possible price to win. You can also set categories and how many items in a category you are prepared to bid for if you win an item. It is all very clever and has captured me some real bargains. The latest bargain is for Mango Moon Sari Silk. This yarn is made from the scraps of silk found around the factories that make saris in India. The women who spin the silk do it by hand using drop spindles in their own homes. This allows them to earn an income without having to stop caring for their famillies. It is a very worthwhile cause that produces a very interesting yarn. The yarn is bulky and uneven but full of bright colours and interesting textures. I got it for less than a quarter of the price (including postage). I am so grateful that people clear out their stash and give me the benefit of cheap yarn! After my lace yarn purchases, I have finally decided that I am ready to start my lace training. When I got home from the Ravelry Day, I spent quite a lot of time searching through my patterns and the internet for the ideal first big lace project. I have finally decided on the Ishbel by Ysolda Teague. I love this little shawl and I don't think I'm alone. There are lots of pictures of this project on Ravelry, 1226 at my last count! I like the pattern and it is a good size to get started. I am not going to use any of my precious new yarn to knit it, but I am going to use the yarn I bought at Uppingham Yarns last summer. I have 2kg of this stuff and it was dirt cheap. I had bought it to felt with, but I haven't plied enough together yet. For once this lack of progress is actually in my favour because it means I can use the unplied yarn to knit my Ishbel with. As it is 100% Lambs Wool is is nice and soft, but it has a little more body to it, than my new yarns, so I won't be afraid of snagging it while I knit. I think this pattern and yarn combination, is a good first step towards my ultimate ambition of knitting the Aeolian Shawl, which is my dream shawl. I am also quite pleased to report that I have finally cast on my contribution to the Milkweed Project. I signed up to take part in this months ago, and as there was a long deadline (December) I have been sitting on my hands. Yesterday I decided that I needed to play with the yarn and see what happened. I am using 4mm needles and knitting in garter stitch, but I am wrapping the needle with the yarn several times to give long loopy stitches. The loops are in random places and are of varying lengths. I think this lack of regimentation (i.e. planning) makes the texture of the knitting more like natural fibrous material. 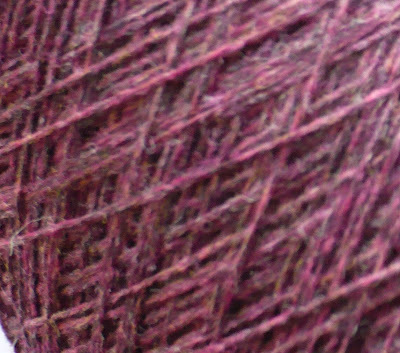 I think this is the sort of texture I am looking for, and I will pick up the project and knit, when I have a spare few minutes, over the coming months.